Jay and Bey. Any of the numerous Kardashian-Jenners. Rihanna. This could easily be a list of Who's Who in Hollywood, or, more likely, a rundown of who Kanye West is most likely to be photographed with. His pack of famous friends is pretty legendary, but also pretty consistent with who he'll sit next to at a fashion show or concert. That is, until Kanye goes all Kanye on us, and turns up with someone completely unexpected, like it's no big deal. Just this week he was at Paris Couture Week (because of course he was) and West hung out with Kristen Stewart. They were even photographed together. What the what? Who knew they were even friends? What could they possibly have to talk about? Who set them up on a friend-date in the first place, and where can I meet this magical matchmaker? I have so many questions we will never get to know the answer to. (Sidenote: Kanye, if you're reading this please write a tell-all. I will pay all of the money for it.) Seeing those two unlikely allies hanging out, not-quite-smiling together, got me thinking about all of the times Kanye has popped up with someone completely unexpected, leaving all of us to shake our heads and speculate wildly. Is K-Stew the oddest Kanye friend we've seen to date? Not by a long shot. 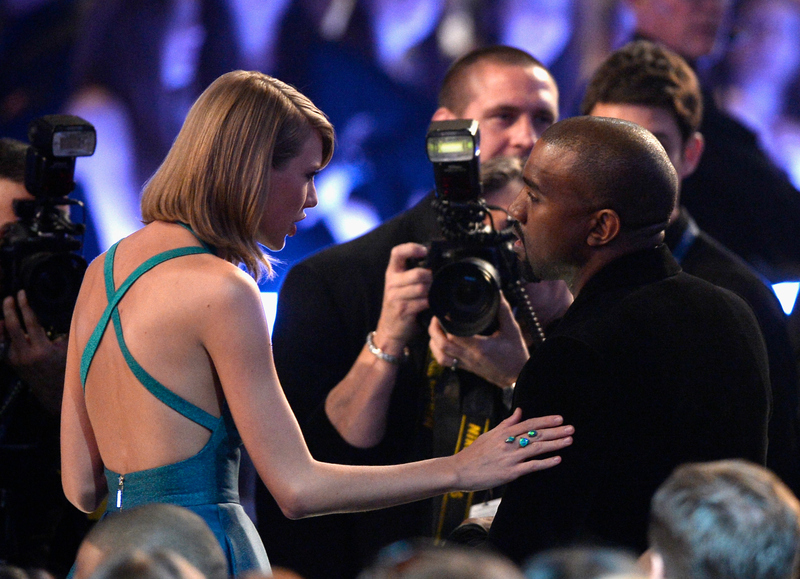 These seven other bizarre people Kanye has hung out with take the cake for most confusing celebrity friendship. Ah, the most classic and awkward duo of them all! Obviously best known for their MTV Awards run-in, West and Swift later went out to dinner together, and left us all to wonder what kind of small talk they could possibly be making. We don't have picture of them at dinner (boo), but we do have evidence that they're buddies again, hanging out at the Grammy's. The material girl and the fashion-music mogul took an epic selfie, and left the whole world wondering what in the blazes the two stars were talking about. Anyone familiar with Anzari's stand up work will already know that these two hang out, but, even though it's normalized, doesn't mean that they aren't an odd couple. Just look at that photo — they're babies! Makes you wonder how far back this friendship goes, and what stories are being omitted. At first glance, crazy bizzaro land. But, when you get right down to it, maybe not that crazy! Fashion is clearly what holds these two together, and I wouldn't be shocked if we saw them come out with a joint line. Yeah this one... this one has me at a bit of a loss. Maybe they're both super into fashion jewelry? Extreme dieting? I have no idea, and that just makes it the perfect Kanye friendship. These two! Lana Del Rey actually performed for her good friends (who knew? ), Kanye West and Kim Kardashian, during their 2014 wedding reception. She allegedly did this for free. For FREE. That's how solid this friendship is! These two are allegedly close friends, with both Williams sisters attending the West/Kardashian wedding. Man, I wish that had been included in Keeping Up With The Kardashians. Heck, maybe there should be a KUWTK spin-off called, "Who Is Kanye Hanging Out With Now?"